This project is considered to be the heart of Behchoko. The renewal of this community complex will allow for activities that will contribute to community culture, identity, pride, and well-being. 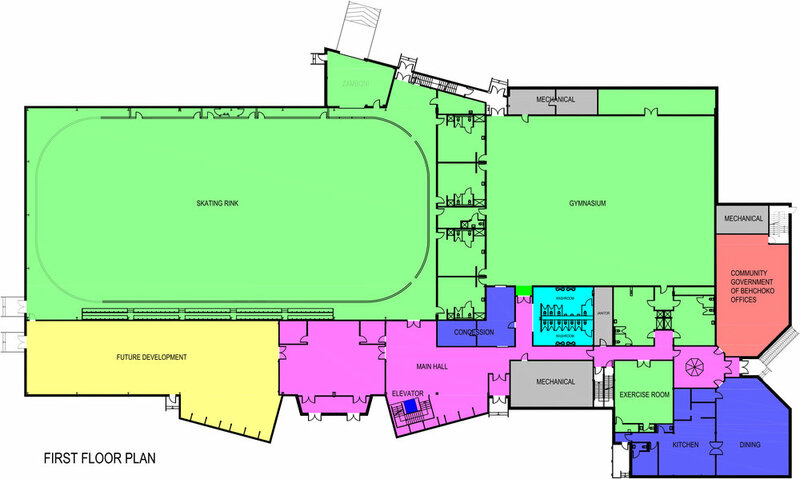 The facility houses an ice rink, a gymnasium, a fitness room, reception and concession, offices, a kitchen and dining area, and a youth centre. The facility will be a community focal point for physical recreation and social activities. This 21,300sq ft building encompasses a 23x53m ice surface, change rooms, washrooms, showers, a kitchen, storage, and offices. The design allows for the future addition of a two sheet curling rink. Special construction techniques were used for the design of the foundation of this facility. This is approx 4'200 sqft barrier free access swimming pool. in the design, servies of the specialized pool company for the supply of the pool materials were used. this pool consists of; a pool area, shower, change rooms, office, whirlpool, sauna, storage, MECH/ELEC rooms.